When we talk about bulking cycles, there isn't a more popular and well known stack than the classic Testosterone-Deca Durabolin-Dianabol cycle. Therefore, in this article we will investigate each compound, and learn how to properly implement this cycle for best results. Due to its versatility, testosterone is known as the perfect 'base of a steroid stack'. It has solid androgenic and anabolic traits, which make it an essential part of a bulking cycle. As a matter of fact, testosterone is popularly used for hormone or testosterone replacement therapy (TRT) that is prescribed to those who are incapable of producing their own hormones as a result of steroid abuse, age, or other medical issues. However, it is important to remember that testosterone aromatizes heavily into estrogen once it is injected. As you may already know, there are several versions of testosterone with different esters attached to them. In this particular cycle (test/deca/dbol), it is most logical to use a long estered testosterone such as cypionate, enanthate, or the sustanon 250 blend (which is mostly made up of long esters). The reason for this is that we already have a kick-starting oral compound (dbol), and deca durabolin is also a long acting ester, so choosing testosterone with a long ester will help us keep injections to a minimum. Therefore, any of those compounds can be injected just twice per week without any problem, and you can mix in deca durabolin in the same syringe with testosterone. Regarding the dosage of testosterone, typically it starts at 400 milligrams (mgs) per week, with some individuals choosing to run a lower or a higher dose (200mgs +/-). The recommended cycle duration for testosterone is approximately 12-14 weeks. Deca Durabolin is a nandrolone based steroid (nandrolone decanoate) that has been widely used since the 60's because of its mild side effects and a much lower rate of aromatization when compared to testosterone. Remember, back in those days bodybuilders did not have access to aromatase inhibitors, so they had to rely on luck, diet, and smarts in order to avoid getting estrogenic side effects. This is why they turned to deca durabolin over testosterone. One of the greatest benefits of deca is its ability to improve mood and increase appetite, making it an incredible addition to the test/dbol bulking stack. Furthermore, it can be ran at moderate dosages without the fear of losing head hair, or causing joint discomfort, as it will not raise DHT in the body. In addition, the joint smoothing property makes it ideal powerlifting. 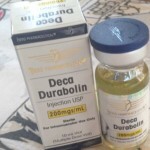 What's more, deca durabolin has a long half life, so it will linger for many weeks after you stop using it, allowing you to easily get away with only 2 injections per week. However, due to this long action, deca is a very dangerous steroid to use if you are a tested athlete because it can be detectable for a whopping 18 months. For instance, Shawne Merriman, a former pro bowl LB in the NFL, was busted for the deca he used several years ago, which was a major error on his behalf. Interestingly, dosages for deca are very debated, with some guys recommending to keep testosterone levels higher, whilst others saying that it does not matter. The reality is that deca overwhelms DHT (dihydrotestosterone) in the body, so you run the risk of having some issues in the sexual department if you do not stack something that converts to DHT strongly enough to offset that. Usually, proviron is a good compound for solving the issue, but in this precise case testosterone will be sufficient. Deca durabolin dose in this stack can range from 200 to 400mgs per week, and the suggested cycle duration is approximately 12 weeks. Dianabol (methandrostenolone) was created by Dr. Ziegler to help American athletes keep up with their Russian counterparts in the 1960's. At the time, Americans complained about injecting testosterone, so he wanted to create an oral version of testosterone that would be easier to take. Hence, essentially dianabol was supposed to be an oral testosterone. The difference is that it has an added double carbon bond, so it can withstand the first liver pass - 17 alpha alkylated (17aa). 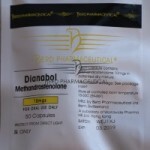 Nevertheless, the main problem with dianabol is the rapid aromatization into estrogen that will occur after taking it. Meanwhile, the benefit is that dianabol is a great kick-start to the test/deca stack because it levels out the longer injectable esters. Dianabol should be used at 20-40mgs per day split dose, and it should be ran only for the first 4-6 weeks of this cycle. Those that have trouble with appetite and want to bulk will enjoy this cycle. Those who want to powerlift and who have a history of joint discomfort (although you should never use steroids to cover up joint problems). Those individuals who have hit weight or strength plateau's, will rave about this class steroid stack, pushing them their barriers. Those that are sensitive to estrogenic side effects like gynecomastia, water retention, high blood pressure, or insomnia should not run this cycle. Additionally, those who struggle with high appetite, or are carrying too much body fat, should look elsewhere. Finally, those preparing for a contest or photo shoot need to be 'shredded' and vascular, so they will not like their smooth results from this stack either. Because all three (3) of these compounds are considered 'wet compounds,' meaning they convert to estrogen, an aromatase inhibitor is essential, or you will face tremendous water retention. Therefore, I recommend using aromasin, or arimidex, in order to prevent those issues. In addition, keeping letrozole on hand in case of emergency is a wise thing to do. Furthermore, since dianabol is liver toxic, you should run a liver support supplement for the first 4-6 weeks of the cycle. Besides, due to the strong likelihood of an increase in blood pressure and heart strain, a comprehensive support supplement like N2Guard should be ran (which also contains liver support and TUDCA). I have personally ran this stack a couple times, and I put on over 10-15 pounds, which is a lot of strain to put on the body. Thus, it is important to remember that a portion of these gains will be muscle, but also a large amount will be water and body fat. My strength rose across the board on my lifts, and I had such an incredible appetite that I would eat 2 entrees. Therefore, expect mood to go up, an increase in libido, and extreme motivation. Also, these results are typically the norm according to the steroid forum community. In spite of the fact that this cycle is a lot of fun, coming off can be brutal. One of the reasons for such a difficult ending of the cycle is that the long esters can linger for many more weeks than you expect. In fact, it can take 6-7 weeks to finally rid your body of active steroid, so you will keep making gains and feeling good even 4-5 weeks after your last injection. However, remember that even a tiny amount leftover is still suppressive. Therefore, it is essential you do not go cheap on post cycle therapy (PCT) and run the perfect PCT for at least 8-10 weeks after this cycle. How is my sustanon cycle? Do you have test/deca/dbol cycle questions? Register on Evo Forums and Post your question, over 100,000 members ready to help.